If you are interested in Shakespeare, you will have a busy time in Stratford Upon Avon. The town has many ancient houses, including some connected to Shakespeare's life, and you will always find a theatre here showing one of his plays. Walk the trail on this page to see the most important places in Stratford connected to the world-famous Bard. 1 Shakespeare's Birthplace. In Henley Street is the farm house where Shakespeare was born in 1564. The Shakespeare Centre library is next door, containing some of the earliest books printed in English and works covering Shakespeare's life and the history of the theatre. 2 New Place and Nash's House in Chapel Street. New Place is where Shakespeare spent his final years. Nash's House, next to New Place, is a museum devoted to the early history of Stratford-Upon-Avon to Tudor times. 3 Hall's Croft in Old Town was owned by William Shakespeare's daughter, Susannah, and her husband Dr John Hall. 4 Holy Trinity in Old Town is the church where Shakespeare was baptized. It is also the burial place of both Shakespeare and Anne Hathaway. 5 The Royal Shakespeare Company is based at Stratford. It currently produces plays in The Courtyard Theatre while the Royal Shakespeare Theatre and Swan Theatre in Waterside are closed for refurbishment. 6 Anne Hathaway's Cottage. In Shottery, one and a half miles from the centre of Stratford, this was the home of Anne Hathaway before she married Shakespeare in 1582. 7 Mary Arden's House. 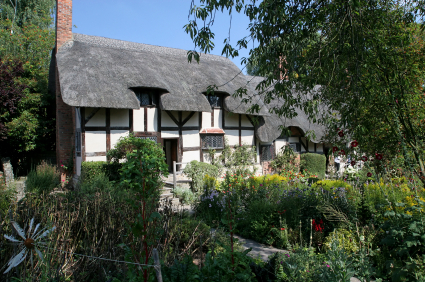 Three and a half miles from Stratford, this was the home of Shakespeare's mother and is located in Wilmcote, Warwickshire. For more walks in the area, see Walk 4 Life (enter CV37 as the postcode in the search box). For more about interesting places linked to Shakespeare, see also Attractions. For things to do throughout the year in Stratford-Upon-Avon, see What's On.